While I’m at Pigstock, an all-around Pig Love event in Traverse City, MI, here’s a guest post from my friend and fellow writer Stephanie Stiavetti; I’m not going to say what her upcoming cookbook is about but here’s a hint. —M.R. Many folks believe that macaroni and cheese is a purely American dish. They’re surprised when I tell them that most European countries not only have their own versions, but that some of theses recipes appeared on the culinary map long before macaroni and cheese became popular in the United States. 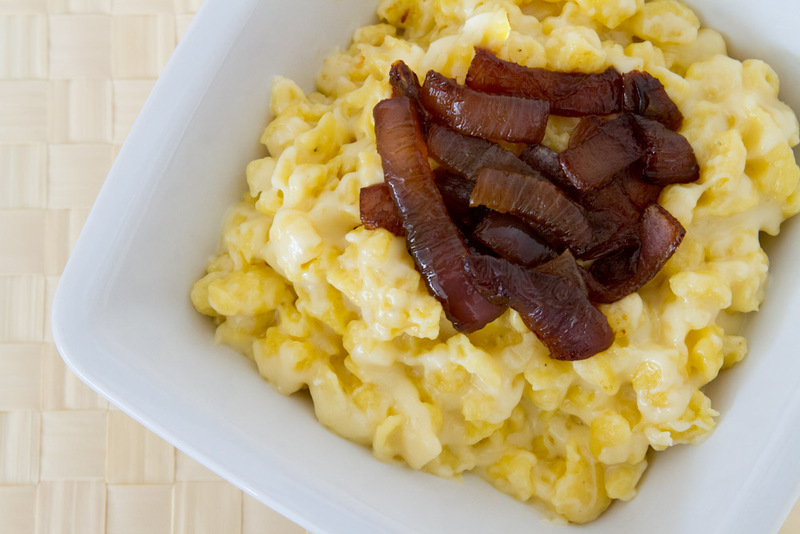 Even the Germans have a macaroni and cheese dish: Käsespätzle. Found in many German homes and restaurants, Käsespätzle is just as entrenched in the traditional Deutsch comfort food lexicon as it is in ours. Pronounced KAE-zeh-SHPET-zleh, this dish is a great example of simple German comfort food at its finest. While American renditions of this German dish may add any number of odd spices, such as nutmeg or mustard powder, a basic Käsespätzle consists only of soft, dumpling-like noodles mixed with melty, stretchy cheese and topped with a touch of caramelized onion. When made from scratch, Käsespätzle beckons to a simpler time when food didn’t have to be complicated to be delicious. It just had to be fresh. If all else fails, you can also use a potato ricer or a large-holed colander. Hell, I’ve even seen people use a cheese grater to make spätzle, pushing batter through the holes with a rubber spatula. Remember, the keyword here is simple. Spätzle noodles are by their very nature imperfect, so don’t spend a lot of time worrying about how your finished product will look. And for those of you who think that making spätzle sounds too difficult, my friend Nico, a twelve-year-old chef in training, was able to master the method on his first try. So, no excuses. My recent post on making multigrain bread from scratch. Here is Stephanie Stiavetti’s bio, and be sure to follow her on twitter @stiavetti. Chef Joachim Wissler is putting a new twist on classic German cuisine at Vendôme. Watch a video of Martha Stewart making Bette’s braised red cabbage. My family is not from the region of Germany that makes Spaetzle. At my house it was Kaseknoedle. Same basic dough, dropped by spoonfuls in the boiling water. Faster, simpler and just as tasty. My mother just added what ever cheese we had in the fridge. I’ve yet to make this, before, but I love cooking German food, and have done spaetzle many times. The trickiest part is keeping the batter/dough from cooking onto the underside of the maker. I will be sure to give this recipe a try. Great guest post!!! To keep this from happening, I use a taller pan so that the water is a few inches below the spätzle maker. This generally keeps them from cooking before they drop into the water. Thanks, Stephanie! I have adjusted a bit to prevent this. The biggest reason it happens is the maker I use. The silly thing doesn’t just have holes in it, it actually still has like the tabs that have been punched out, folded straight down at a 90 degree angle. It’s annoying, but I’ve managed pretty well, with it. Thanks, again, though, for the suggestion! I’m going to click over and check out your blog, now! Will have to try this recipe out…the one I have doesn’t have any cream in the batter, just flour, eggs and salt. I have a board that my Swiss-German ex gave me – it’s a plastic dinner plate sized contraption – one half is perforated, the other half is solid, along with a scarper to force the dough through the perforations. It sits on top of a large pot, so it leaves both hands free. And I always transfer my Spätzle into a bowl of cold water, to stop them cooking, then drain thoroughly in a colander. I love spätzle! A tip is to try them as a dessert served with apple-sauce. I love spatzle and make it often during the winter. I bake mine until the top gets crunchy. Love this post! Macaroni and Cheese is iconic!